the Antiquities Ministry said in a statement. 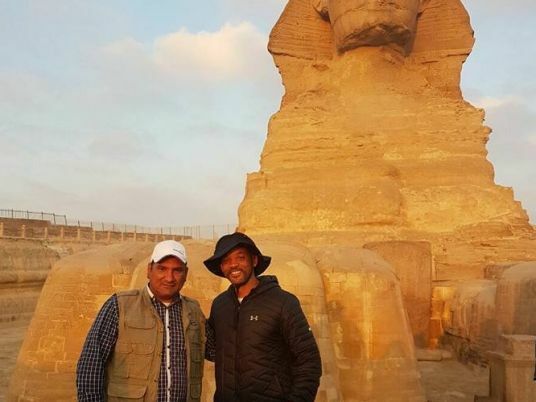 Ashraf Mohie, director of the Giza Pyramids area, escorted Smith's family on their tour. Former antiquities minister and famed Egyptologist, Zahi Hawass, accompanied them at the Sphinx and the Great Pyramid. Mohie said Smith expressed his deep admiration for the greatness of ancient Egyptian civilization, which has been one of his passions since childhood; as a child, Smith dreamed of being an Egyptologist to delve deeper into the mystery of the pharaohs. Smith and his family took photos in front of the pyramids, hoping to come back again as soon as possible.